If you’re in the market for a new minivan, you should consider the 2018 Dodge Grand Caravan. However, since this spacious and family-friendly vehicle comes in three trims, you also might not be sure which model is right for you. Use this breakdown of the differences between the Grand Caravan trims to decide which one is right for you. The first model in the Dodge Grand Caravan lineup is the SE. Take a look at the outside of the SE and you’ll discover great standard features that include 17-inch steel wheels, heated side mirrors, daytime running lights, and a rear window washer and wiper. 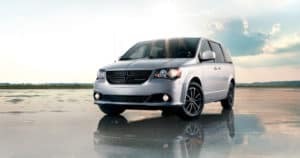 Lift the hood of any Grand Caravan and you’ll find a 3.6-liter V-6 engine that provides 283 horsepower. Not only is this engine ideal for hauling around the family, it’s also powerful enough to bring along some extra toys on your next weekend getaway. That’s because the Grand Caravan has a maximum towing capacity of 1,500 pounds. Climb inside the Grand Caravan and you’ll discover plenty of seats to hold the entire family. You get a second-row bench seat and a third-row Stow ‘n Go bench seat that offers a 60/40 split. You’ll also find cloth seats, three-zone manual climate control, power locks and windows, interior observation mirror, and an outside temperature display. Finally, the infotainment system includes a 6.5-inch touch-screen display that includes an integrated rearview camera, audio input jack, six-speaker audio system, and steering wheel-mounted audio controls. The SE Plus is the next vehicle in the Dodge Grand Caravan family. This vehicle takes all the great features you find on the SE model and adds automatic headlights, fog lamps, and body color side mirrors. You’ll also enjoy stylish 17-inch gloss black rims. Inside the SE Plus, you’re upgraded features include premium cloth seats, an automatic-dimming rearview mirror, remote start system, and a leather-wrapped steering wheel and shift knob. Your infotainment system will also add a USB port and Bluetooth connectivity for voice commands and streaming audio. The top-of-the-line SXT model is the last trim level in the Dodge Grand Caravan lineup. Exclusive exterior features on this vehicle include 17-inch silver aluminum wheels, side roof rails, integrated roof rail crossbars, power sliding doors on the right and left side, and a power liftgate. Interior features that you’ll only find on the SXT include a third-row bench that flips completely around for comfortable tailgate seating, leather and suede seats, and power-adjustable driver’s seat. Additionally, like every other Grand Caravan in the lineup, the SXT comes with some great safety features. These features include advanced and multi-stage front airbags, keyless entry, a tire pressure monitoring system, electronic stability control, and a chime that alerts you when the power side door is closing. From the comfortable SE to the impressive SXT, the Dodge Grand Caravan has a great lineup of trims. If you’re interested in learning more, head to your dealer and take each one for a test drive today.